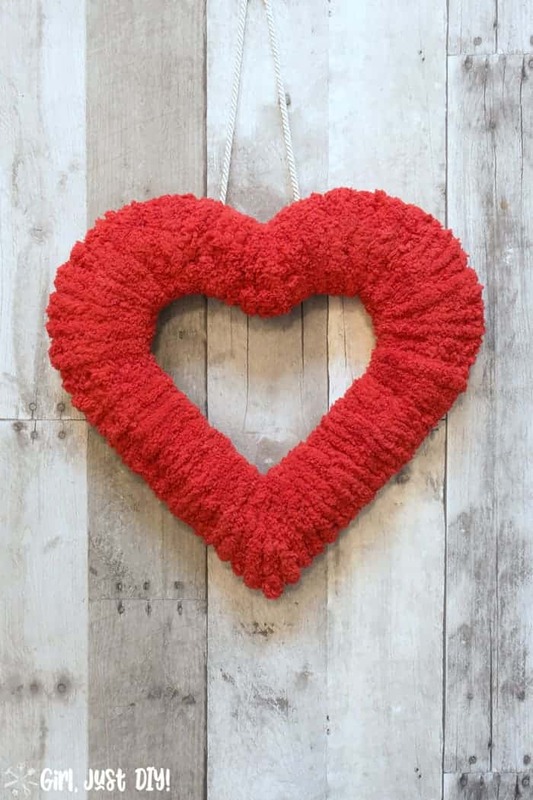 Double-Sided Fluffy Valentine Wreath - Girl, Just DIY! 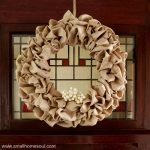 Have you ever hung a wreath in a window? It looks great from the inside but the view from outside isn’t great. 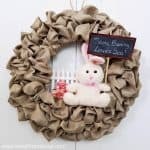 Today I’m going to show you how to make a double-sided fluffy valentine wreath that you can enjoy from inside or out. 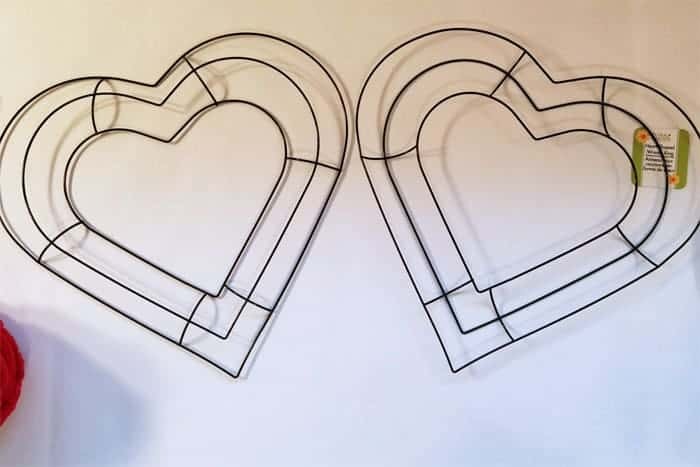 As with most crafty people I bought the wire wreath forms last year and they’ve been in my “craft supply” area since the day I got them. I’m determined to use up that stuff and since I’m currently loving the fluffy yarn (did you see the Fluffy Winter Wreath I made?) I decided I wanted to make a fluffy version of a valentine wreath. If you buy two separate wreath forms you’ll need to put them together. Originally I tried using the glue gun but the forms weren’t perfectly identical so I had to scrap that and go with plan B. 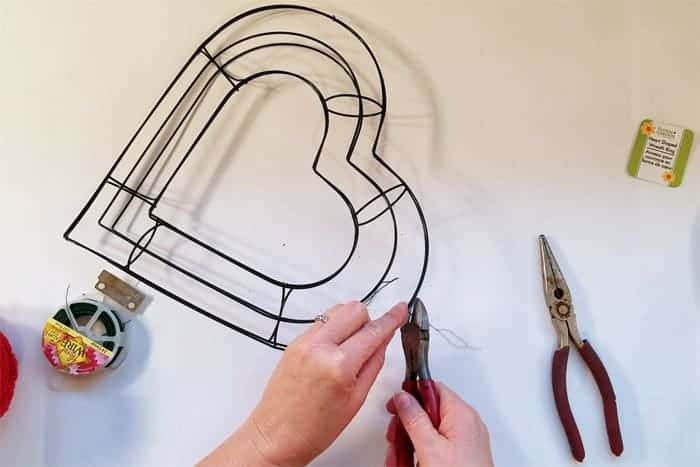 Cut four or five pieces of 4″ Floral Wire. Starting at the bottom point wrap the wire tightly around the two forms to join them. Work your way around and connect the two forms together in about 5 spots. This doesn’t need to be perfect since we’ll be covering it completely with the yarn. Tighten the wire with pliers and snip off the excess leaving about 1/8″ tail. Fold the tail and pinch it with the pliers so that it’s on the inside of the form. 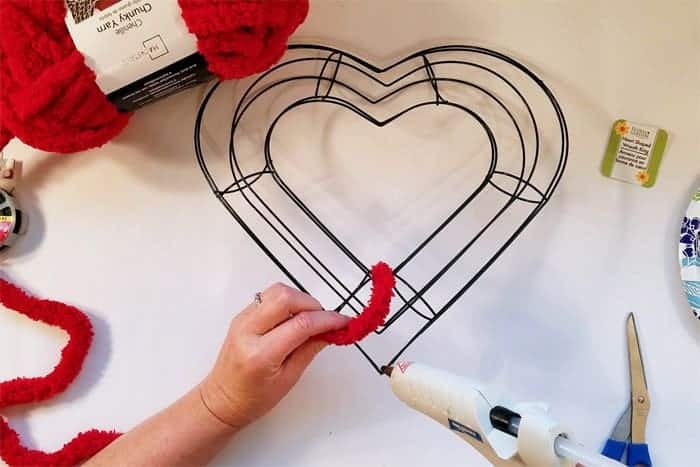 I tested this a bit and knew I was going to have issues on the point of the heart wreath. Ultimate here’s what worked best. Pull out and cut off about 3 feet of the fluffy yarn from the skein. 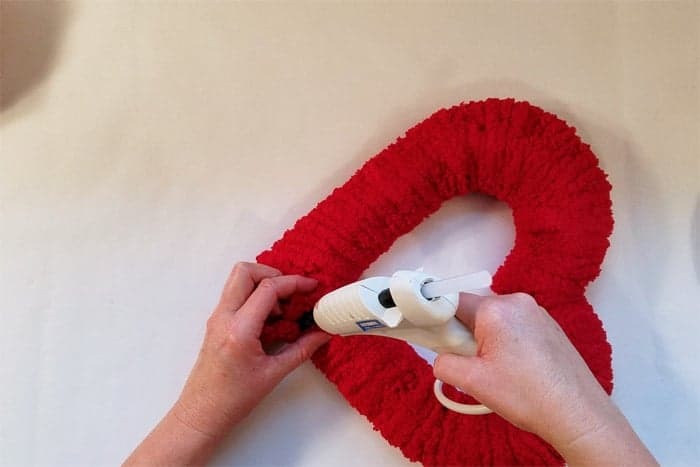 Glue the end of the yarn into the inside V of the heart wreath. Next glue the yarn to the very bottom of the wreath. Continue wrapping and gluing until you have the bottom square (see above) of the wire wreath covered with fluffy yarn. Glue the end to the wire form and trim the excess. 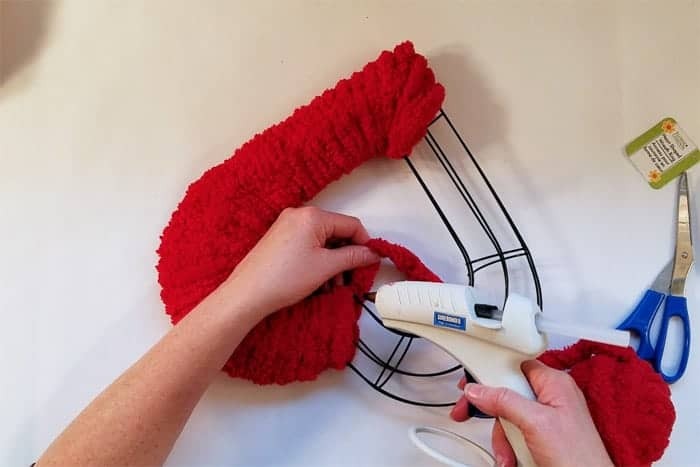 Grab the end of the fluffy yarn and glue it to the piece you just trimmed. Keep wrapping. 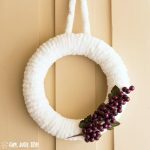 You’ll want to adjust the yarn and bunch it together as you wrap it around the wire wreath and secure with hot glue every so often. 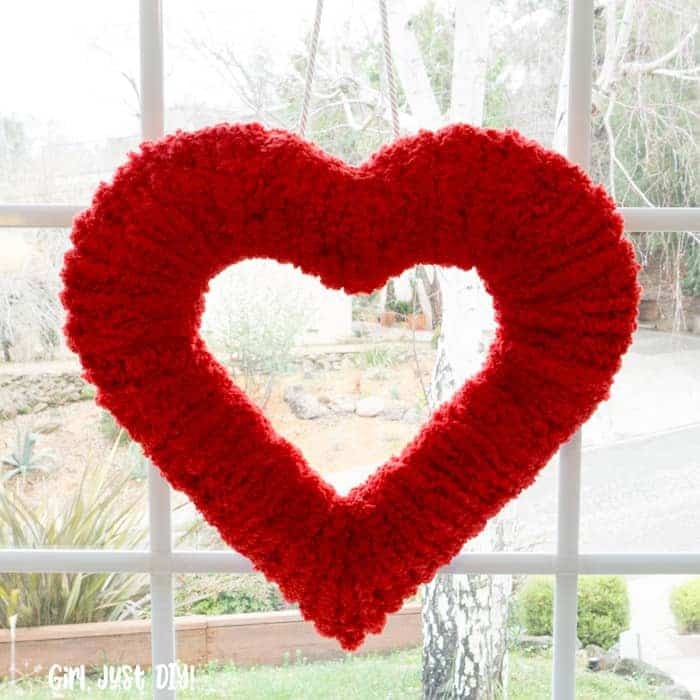 This valentine wreath will take about 1/2 of the skein of fluffy yarn. You can either roll the yarn into a ball or pass the entire skein through the center of the heart. That might prove difficult depending on size of your skein. As you can see from the picture below I chose to roll part of my skein into a ball. 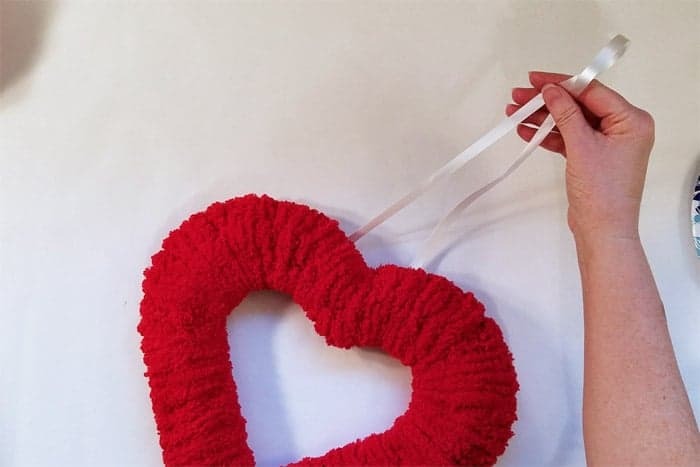 You’ll need to hot glue the fluffy yarn to the inside point of the heart to keep it from slipping. 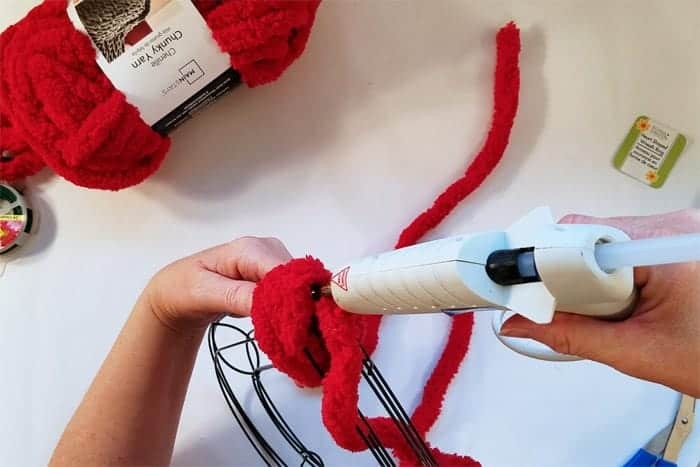 Wrap and hot glue until you feel that the yarn is staying in place. 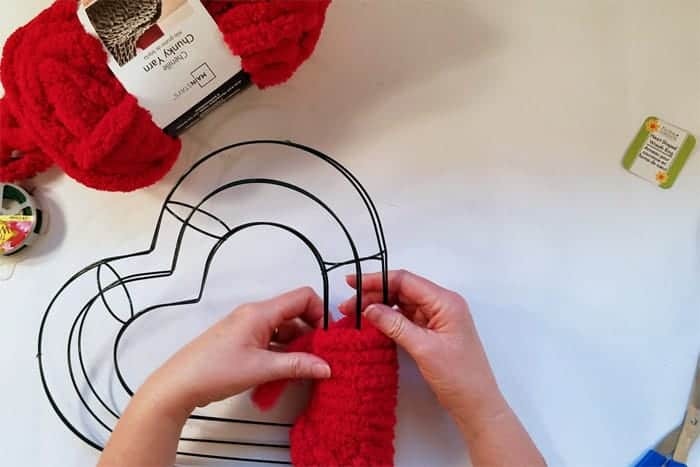 To finish off the fluffy valentine wreath separate the yarn to expose the wire form and hot glue the yarn in place. 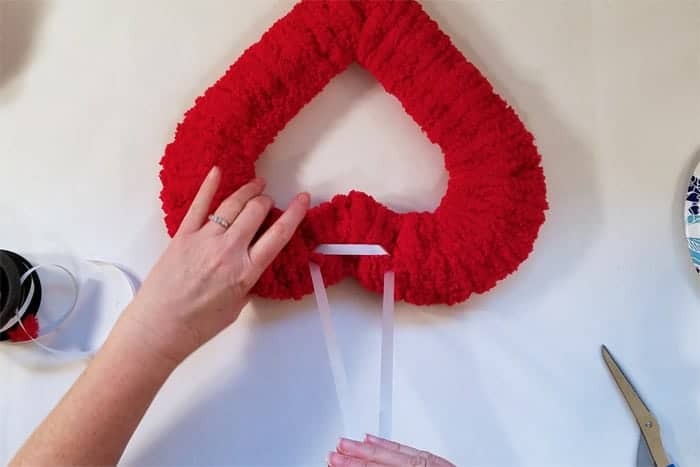 To make this a double-sided Valentine wreath lace a piece of 1/2″ wide white ribbon through the wires under fluffy yarn as shown below. Now when you hang the wreath in a window it will look great from both sides. 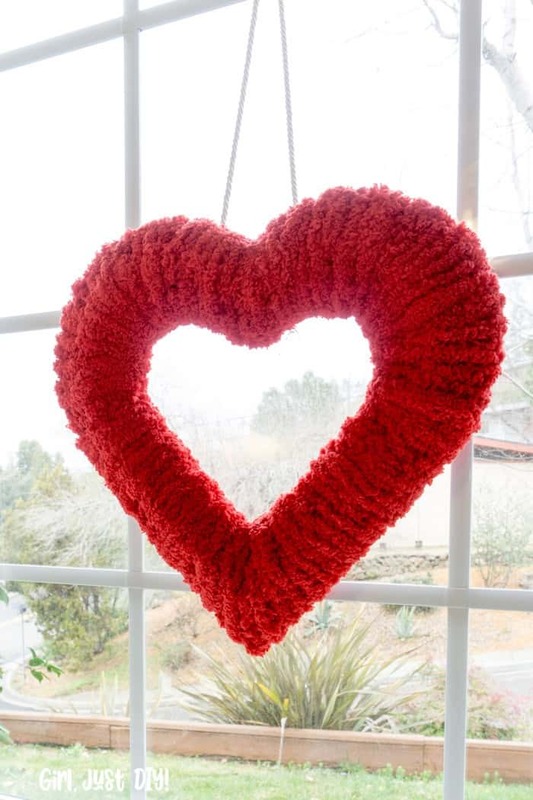 A suction cup hook works perfectly to hang your beautiful Fluffy Valentine Wreath in the window. Ours is hanging in the front window so my husband can see it when he gets home from work. You can also hang it on your front door, in the house, or on a mirror knowing that the reflection will look as good as the front. 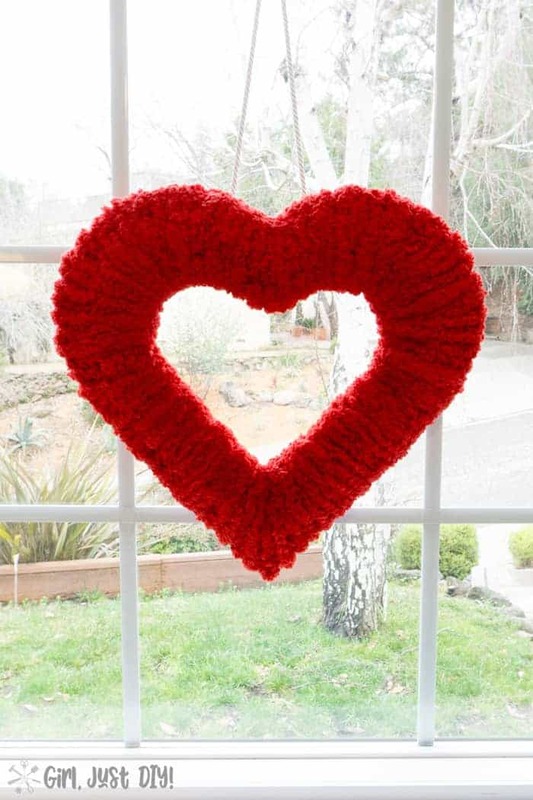 Are you a Valentine crafter and decorator? 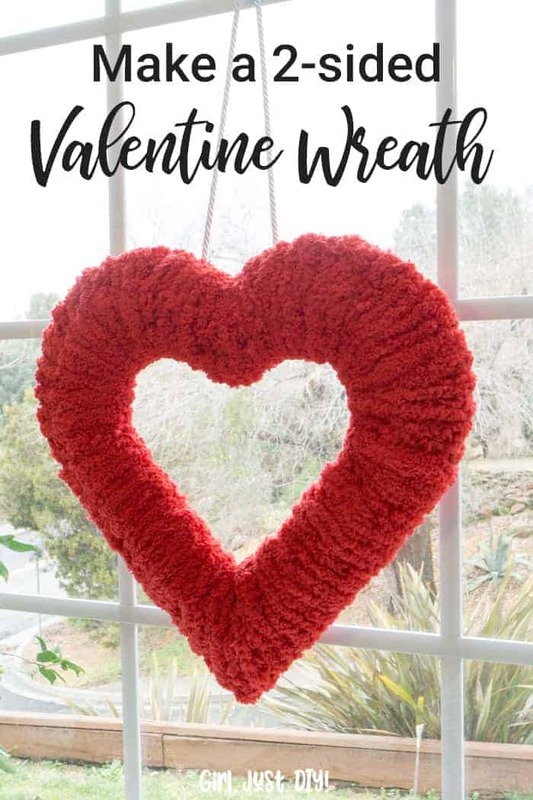 If you love this fluffy double sided Valentine Wreath and think your friends will too, I’d love it if you’d share it with them on Facebook, or pin it to your Wreath or Valentine boards. And, I hope you get to spend the day with your favorite loved one sharing a heart-shaped pizza. Before you know it Spring will be here. Get a jump on your Spring crafts with this bright Paper Wrapped Spring Wreath. 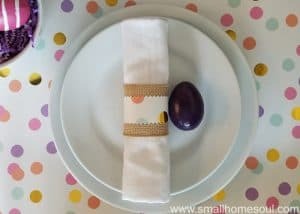 And the kiddos will love painting some Colorful Easter Eggs that you can keep and use from year to year. 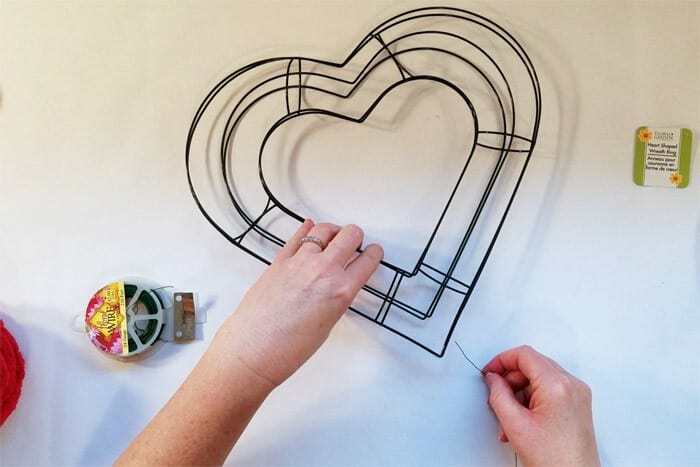 Since I don’t have much Valentine decor yet I thought I’d share three of my favorite projects by my blogger friends. Michelle at Michelle J Designs created a Beautiful Valentine Watercolor Printable you can download; Anika at Anika’s DIY Life made a Valentine Wall Art Puzzle, and Vineta at The Handyman’s Daughter made some Wall Art Puzzle. So many great projects to inspire you! I just searched and couldn’t find any pre-made forms. If you wanted to wrap anything around it you’d have to bulk it up somehow and that might prove challenging.